Has weight loss made it on to your list of New Year’s resolutions? Have you tried to drop pounds in the past only to feel like you weren’t making progress? If you answered “yes” to one or both of these questions then read on as I fill you in on a concept called “metabolic positioning” which will help you avoid a lot of frustration and help you learn how you can put your metabolism in a position to help you lose weight at a rate of up to 50 percent faster. Have you ever heard yourself saying either out loud or in your head, “I lost two pounds this week, then went out to eat and gained it all back!” Sound familiar? we’ve all been there. Have you ever heard yourself saying either out loud or in your head, “I lost two pounds this week, then went out to eat and gained it all back!” Sound familiar? We’ve all been there. Our bodies store excess energy as body fat, but also as glycogen. What’s glycogen, you ask? Glycogen is the stored form of carbohydrates found in our liver and muscle tissue. Our bodies need a constant supply of energy in order to survive. That energy comes from three different sources (think of them as gas tanks): our blood sugar, stored glycogen, and body fat. When we are trying to lose weight, we want our bodies to start accessing stored body fat more regularly and burn it off for energy, right? Say “yes.” Think of the glycogen as the “in between” energy source, sandwiched between immediate blood sugar and body fat. Our bodies can store several hundred grams of glycogen – enough to power us for three or four days before we need to start using body fat. It’s important to recognize that our bodies are rarely, if ever, using just one “gas tank” at a time. Rather, a percentage of each gas tank is being used at once. We start out using a very small percentage of energy from body fat, and as we plow our way through that stored glycogen, we begin to use body fat for energy in higher percentages. Still with me? An important note: Every gram of glycogen carries with it three times its weight in water. A gallon of water weighs more than eight pounds. 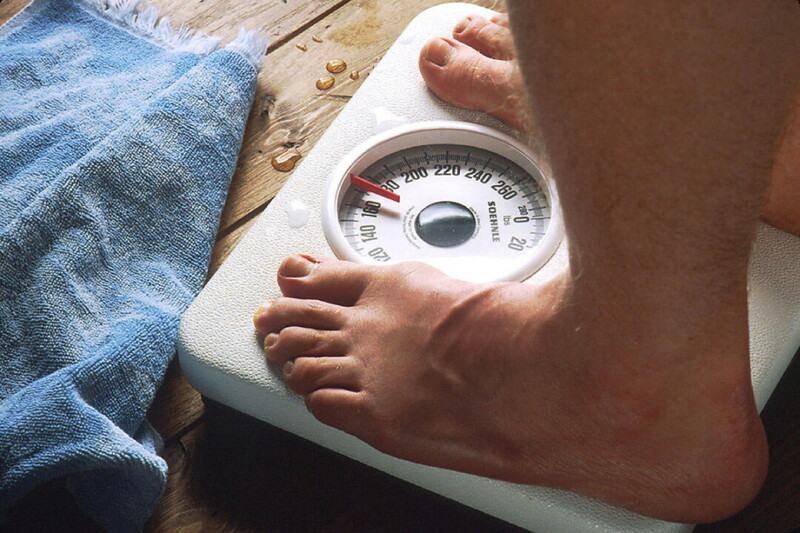 “I lost five pounds, but it was probably only water weight.” Sound familiar? I hear it all the time. Most people fail to realize how important that initial water weight loss actually is, and they tend to downplay it and shrug it off as if it’s insignificant. However, we get frustrated and upset when we gain it back, assuming it’s body fat, which not much of it usually is. If you went through the entire week being consistent and seeing the scale drop down a couple of pounds, then go eat your favorite pasta dish at Mona Lisa’s downtown, do you have a guess as to what will most likely happen to your weight the following morning? If you said, “I refilled glycogen stores and those carbs carried excess water with them, so I gained back the initial weight that I lost but it wasn’t body fat,” then you would be absolutely correct! Moving past that initial drop in body weight is where the magic starts happening. That is when you start using that body fat in higher percentages as I mentioned above. What if you then lose a couple of pounds again and then have a big bag of popcorn at the movies? The amount you consume at one meal in excess of what you can use will be stored as glycogen and some as body fat if you really go overboard. This is where people feel like they are taking two steps forward and two steps back week after week – a lot of work, but no traction. So what’s the answer to this hamster wheel of a problem? Get yourself into that metabolic position of using a higher percentage of body fat and stay there consistently. Consistency will win this. Every once in a while it is good to get an increase in food to keep that metabolism humming along, but too big of an increase and you’re back at the starting line for a couple of days. But don’t sweat it. Now you can let your mind rest at ease knowing what you’ve gained is not body fat and just jump right back in where you left off instead of dwelling on it for a couple of days. Once you are in this metabolic position consistently, you can lose weight up to 50 percent faster than under normal circumstances! Kyle Frank is a nutrition consultant and weight loss and motivation coach with the Diet Doc Eau Claire.